Karen stumbled upon Stryke Fitness in January 2016 by walking into class not knowing who or what it was...and she has been hooked ever since! She is from Summerville, SC but currently lives in Hanahan with her husband Wes and fur Baby Sumter. Karen and Wes are currently expecting their first Baby this year of 2018. They love boating and mountain biking in their free time. She is a Surgical Technologist for Charleston ENT in West Ashley. Her favorite part of Stryke is seeing others transform inside and out, jas as she has. With her own weight loss came better overall health, confidence and happiness which she hopes to spread to others. Like Maya Angelou once said, "People will forget what you say to them but they will never forget how you made them feel." Lauren Brown started Stryke by helping out a friend with a video. Unknown at the time, it ws the audition tape for a fitness reality show and Stryke was born. Since then, she has given birth to her first child and the youngest Stryker Arden is not nearly 2 and all over the studio getting her Stryke on. Stryke Fitness is such an adaptable fitness program that she was able to continue the routines throughout pregnancy and to the very day before she delivered. 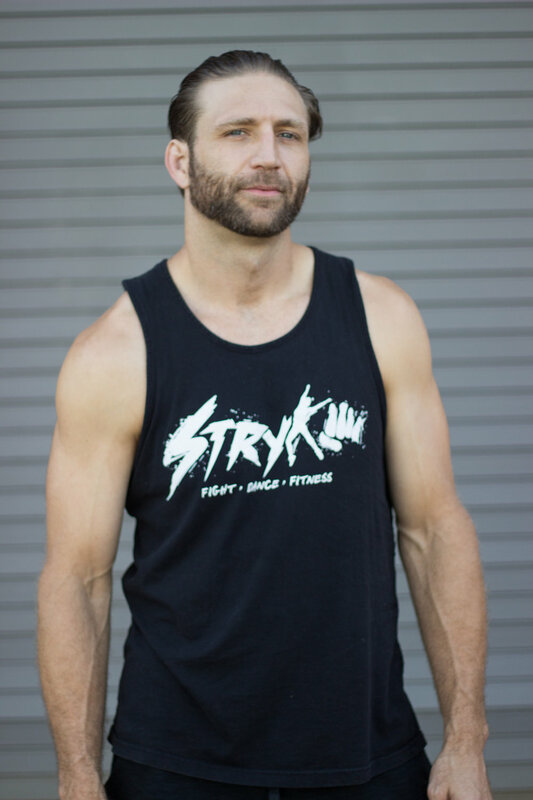 The endurance your body gains and builds through Stryke is a true testimony that this program will change you. "I love to see the confidence from the ladies who come here, seeing them swap out their baggy shirts for fitted tanks shows you they know they look good," said Lauren. My favorite part of STRYKE is the relationships I've made along the way. The guys can't go unmentioned here either, it's awesome to see them really start to move their hips. Lauren's Husband and fellow Stryker Calen Brown has been traiing with the program since the beginning as well." Lauren works as a lending representative at a credit union. she enjoys taking her daughter to the park to swing and serving in her church on the coffee team. Adrienne has worked out with Erin Mansour since 2006 and continued to follow her as a student to the many locations she has taught her fitness classes over the years and even trained out of her house. She took a pause to power lift until she had her third child. After her daughter was born she found herself back at Erin's side taking Stryke in 2015. Adrienne has been an athlete her entire life and has done everything from soccer, gymnastics, cheerleading to even rugby in college. "I love working out, I always have. I love the mental balance it gives you and nothing gives me more joy than watching people take control of their lives. Stryke is the platform that people can use to acomplish this. It's fun, it can be as intense as you want to make it it is on you. The community support you get from the class is like nothing I've ever done before!